Quick and easy brownie bowls, ready in 30 minutes and made with simple ingredients. Change the filling, frosting and decorations to fit theme of any event. The first time I saw brownie bowls was at a birthday party a few years ago. I thought it was a brilliant idea and the possibilities of fillings and decorations were endless. So, I got to work and tried a few different methods to make them myself (I will be discussing more of that below) and ended up with one technique that works the best. 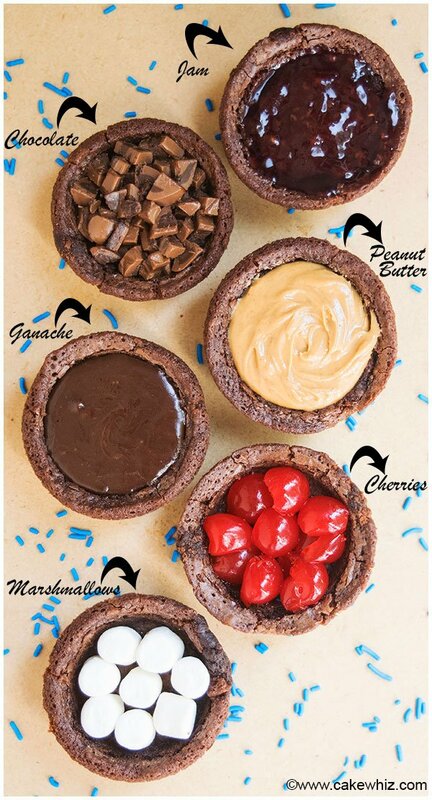 The BEST thing about these brownie bowl cups is that you can fill them with whatever you like. 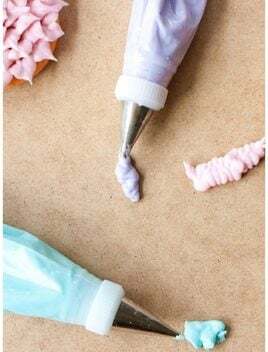 As for frosting, using Pillsbury™ Filled Pastry Bags makes it easy. Currently, chocolate fudge, vanilla and cream cheese flavors are available. 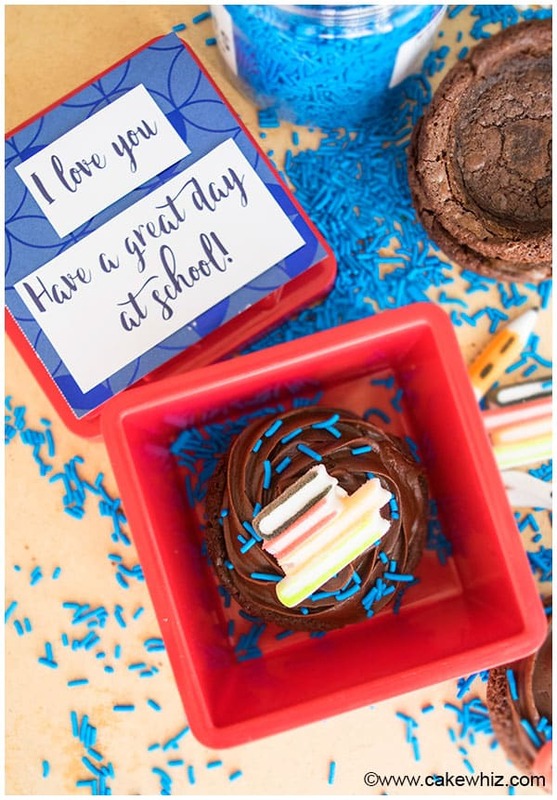 My family and friends LOVE these and since “Back to School” season is here, I made some brownie bowls to match the occasion. 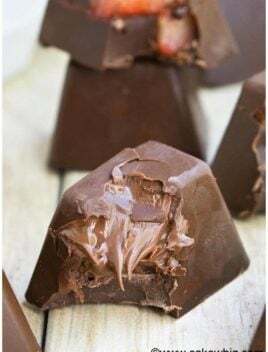 No one knows what the filling is until they bite into them, which is always a nice SURPRISE for kids. You can even add these into your kids’ lunch boxes with a CUTE note. Can you imagine the look on their faces when they see them at lunch time? I think the beginning of a new school year is a special time and kids DESERVE this treat on their first day! 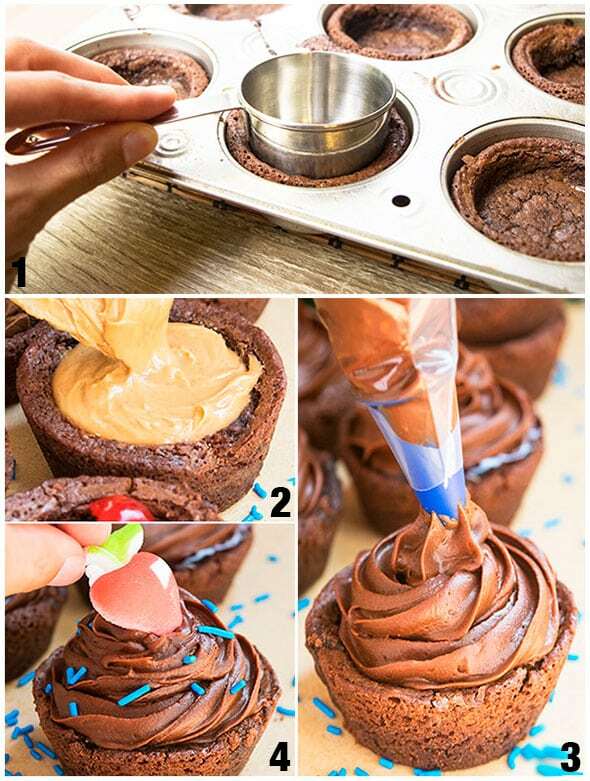 How to make brownie bowl with muffin pan or cupcake pan? First method: Pour brownie batter in the cupcake pan. Then spray the underside of another cupcake pan generously with oil and place it on top of the brownie batter. Bake until brownies are done. When they cool down, remove the top cupcake pan. Run a spatula around each brownie and remove it from the pan and you will end up with brownie bowls. Second method: Pour brownie batter in the cupcake pan and bake until done. 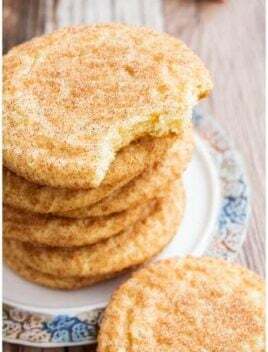 Remove them from the oven and quickly press the bottom of a measuring cup into each cupcake until you have a deep indentation. Do this before brownies have a chance to cool. After the brownies cool down, run a spatula around each brownie and remove it from the pan. Third method: Prepare the brownies and allow them to cool. 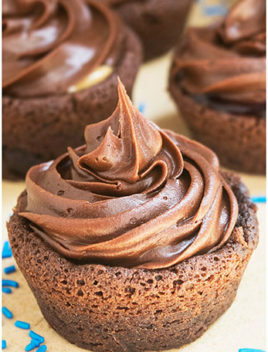 Then, use a sharp knife and cut out a hollow center in each brownie cupcake and fill it whatever you like. Among the 3 methods, I prefer the second one. The first one never works for me because the brownie batter overflows and makes a mess in my oven. The third method causes me to throw out a lot of brownie. How long do you bake brownie bowls? 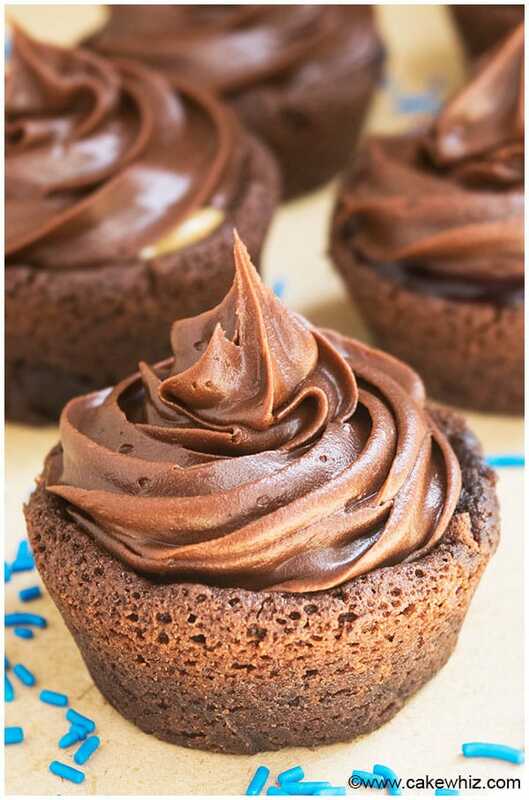 It takes about 20 minutes for these brownie bowl cupcakes to become firm along the edges but still stay soft and fudgy in the center. How do you make a brownie sundae? Prepare the brownie bowls first. 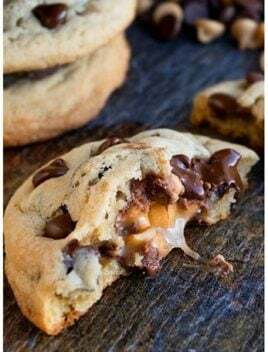 Once they have cooled down, fill them with scoops of ice cream and all the topping your desire like sprinkles, fudge sauce, whipped cream etc. These individual brownie bowls for ice cream are also perfect for summer birthday parties! 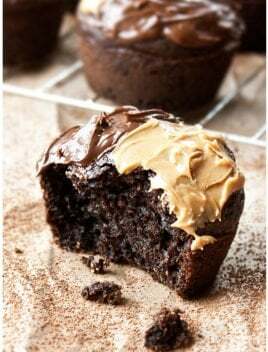 How do you make brownie cupcakes? Prepare brownie batter first. Then, pour it into a greased cupcake pan rather than a rectangular pan and bake until fully cooked. SPRAY the cupcake pan generously with oil or else the brownies will stick to the pan, making it very difficult to remove. Brownies can only be removed from the pan once they have fully COOLED or else they will break. Use brownie mix instead of making brownies from scratch since they are less likely to stick to the pan. 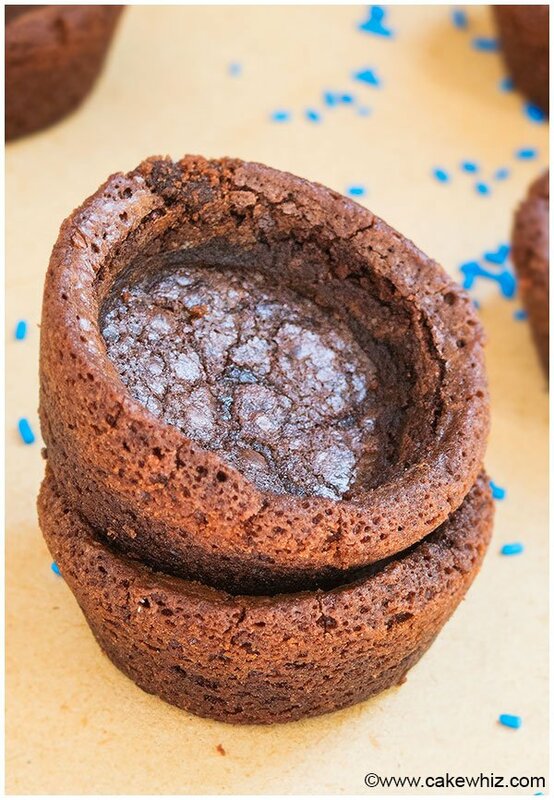 You can use brownie bowl molds BUT using a muffin pan or cupcake pan is cheaper and easier. 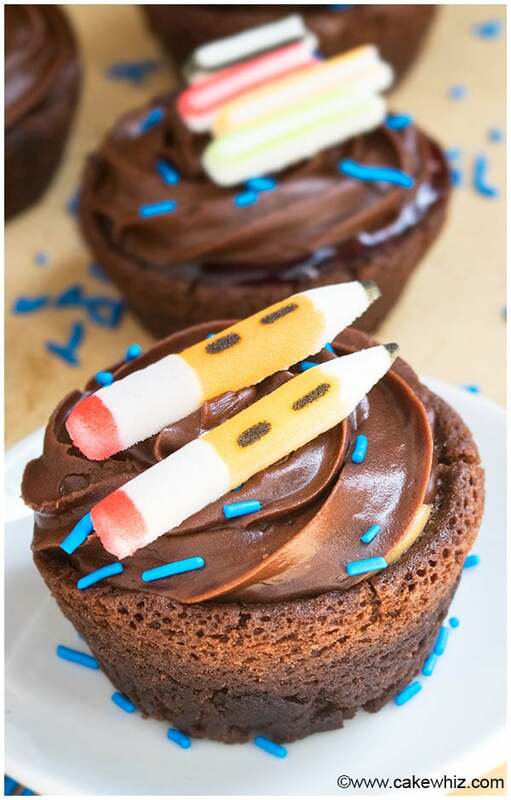 You can make these brownie cupcake bowls for any themed event. Just adjust the decorations accordingly. I used Pillsbury products to make these edible bowls (Pillsbury Chocolate Fudge Brownie Mix- Family Size, Pillsbury Filled Pastry Bag- Chocolate Fudge), which made this entire process very easy and fun for my son! The wonderful people at Pillsbury also sent me some baking worksheets that my kiddo and I enjoyed doing, while the brownies were baking. We did some math with brownies later too. Also, Pillsbury wants to inspire you to join Operation Celebration. 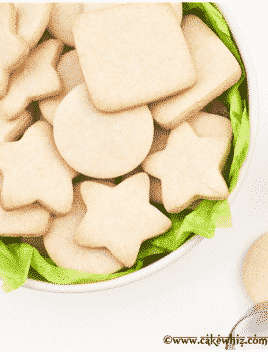 Sign up HERE to receive baking ideas! 2 tbsp Fillings Jam, Peanut butter, Chocolate bits, Ganache e.t.c. Prepare the brownies, as per box instructions. Before the brownies have a chance to fully cool down, press the bottom of a small measuring cup into each brownie until you have an indentation. When the brownies cool down completely, remove them from the pan. Running a spatula around each brownie will help. 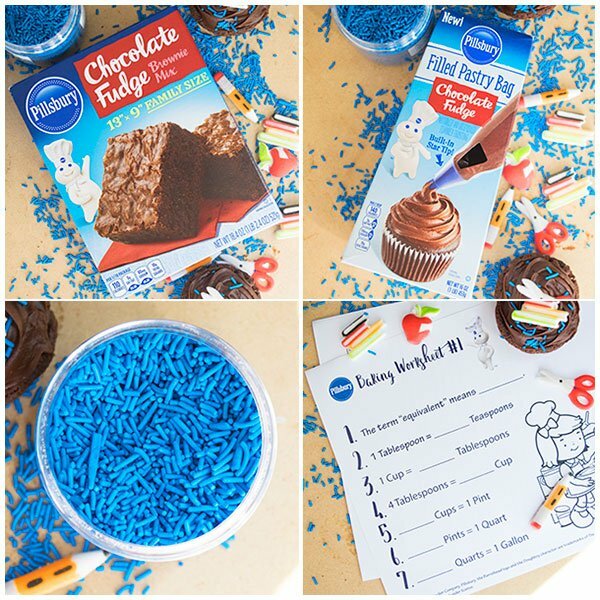 Fill each brownie bowl with a different filling. Top it off with frosting, sprinkles and decorations. Enjoy! What a great idea! I need to do this very soon!